Sitting on arched pillars, this lovely high cascading fountain boasts four intricately designed bowls in a faux stone finish. Water gently pours into each pool, providing a soothing sound that's enjoyable for indoor and outdoor areas. 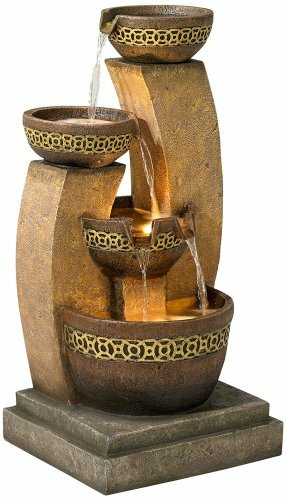 This beige and brown faux stone fountain also features halogen lights designed to illuminate the flowing water at night. With lightweight construction and the flexibility to place it nearly anywhere in the home, this waterfall fountain will instantly enhance the serenity and beauty of any garden and living space. - 41 1/2" high x 20" wide x 18 1/2" deep. Weighs 29.2 lbs. - Faux stone finish; lightweight cast resin construction makes it easy to move and position. - Water flows down four levels into lower basin, creating a soothing sound. - Built-in halogen lights in lower two basins illuminates the fountain at night. - Comes with water pump and three 5 watt halogen bulbs; easy to set up and use. - Cord is 6 1/2-feet long. Faux stone finish; lightweight cast resin construction makes it easy to move and position. Water flows down four levels into lower basin, creating a soothing sound. Built-in halogen lights in lower two basins illuminates the fountain at night. Comes with water pump and three 5 watt halogen bulbs; easy to set up and use.